Get your hands on a Ladykerry necklace! 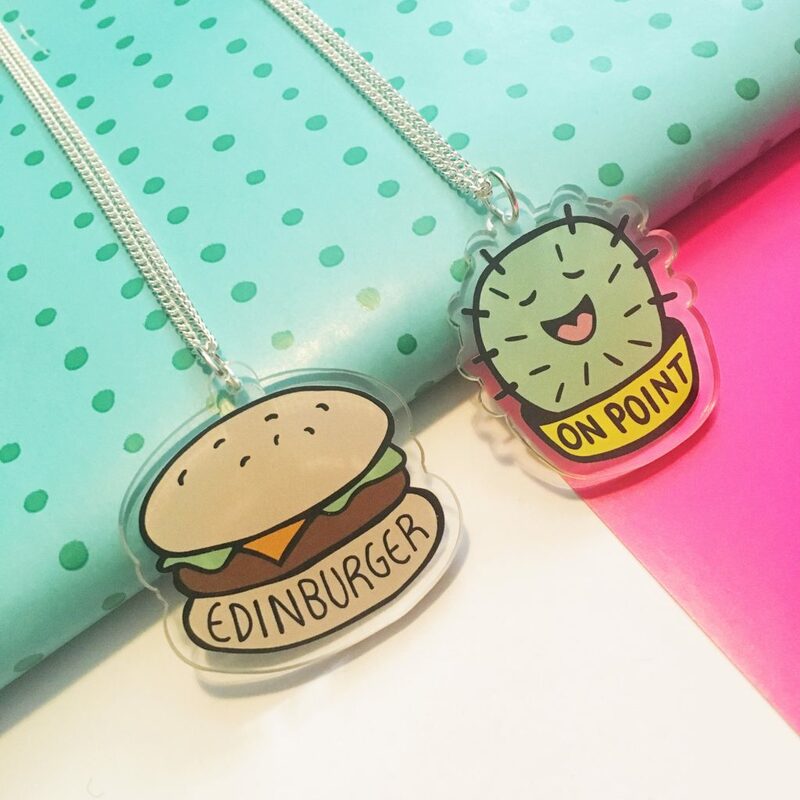 Ace news – you can now buy super cute necklaces from the Ladykerry Etsy store! Currently, there are two designs available. If the necklaces prove popular then I’ll add more designs over time. Feel free to comment with any Ladykerry favourites you’d love to see as a necklace. I can be the Queen of procrastination. Making necklaces has been on my to-do list for over a year but I kept putting it off. I wanted to ensure that they would be of a quality worthy of adorning your lovely necks! Through investigation, I’ve found a supplier who can take my designs and print them onto acrylic charms. All I then need to make them into awesome necklaces is a chain, jump ring, pliers plus an equal measure of elbow grease and magic. And I am SO PLEASED with the end result! They are definitely neck worthy. The two designs I’ve chosen are my Edinburger design and On Point design. 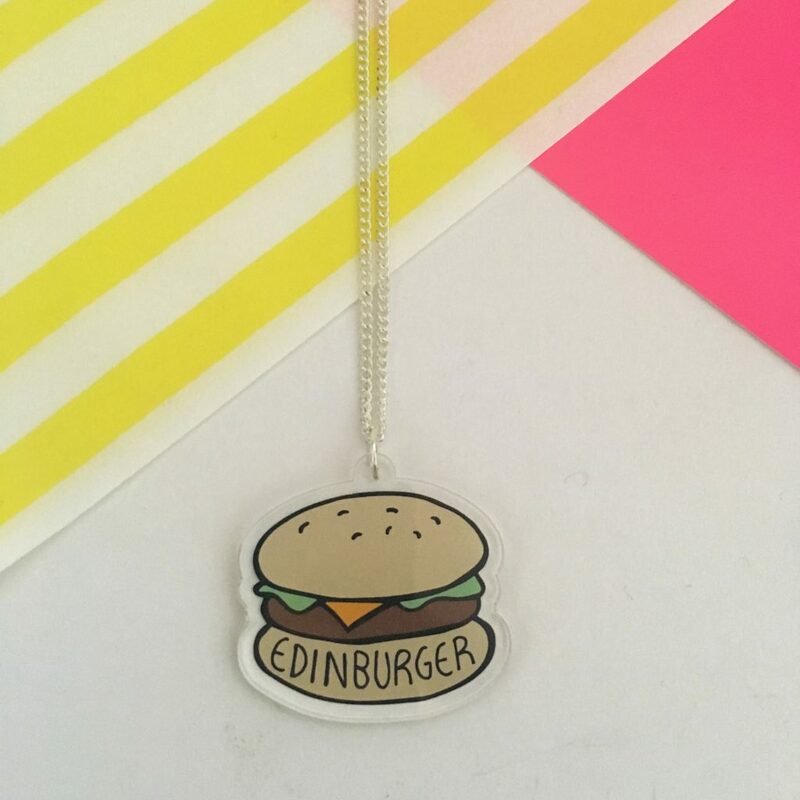 The Edinburger necklace is likely to appeal to a niche audience and is a humorous design celebrating my hometown, Edinburgh. Launching necklaces is a special step for Ladykerry, so including the Edinburgh tribute design seemed a natural choice for my necklace range launch! For those not familiar with the design, it features a burger illustration with a pun on the term for people who live in Edinburgh – Edinburger. Originally, I drew this design specifically to be made as an enamel pin badge. It has proven to be incredibly popular – particularly over the Edinburgh Fringe Festival. Read more about the story and inspiration behind the Edinburger design in my blog post here. The second design I chose to make into a necklace is the On Point cactus design. Originally, I drew this cute cactus solely as a fun design to print on button badges and stickers. I then gave them away in my birthday pop up goody bags back in April. Those who were lucky enough to get one adored it so much that they requested ‘On Point’ became a permanent design in the Ladykerry product line. 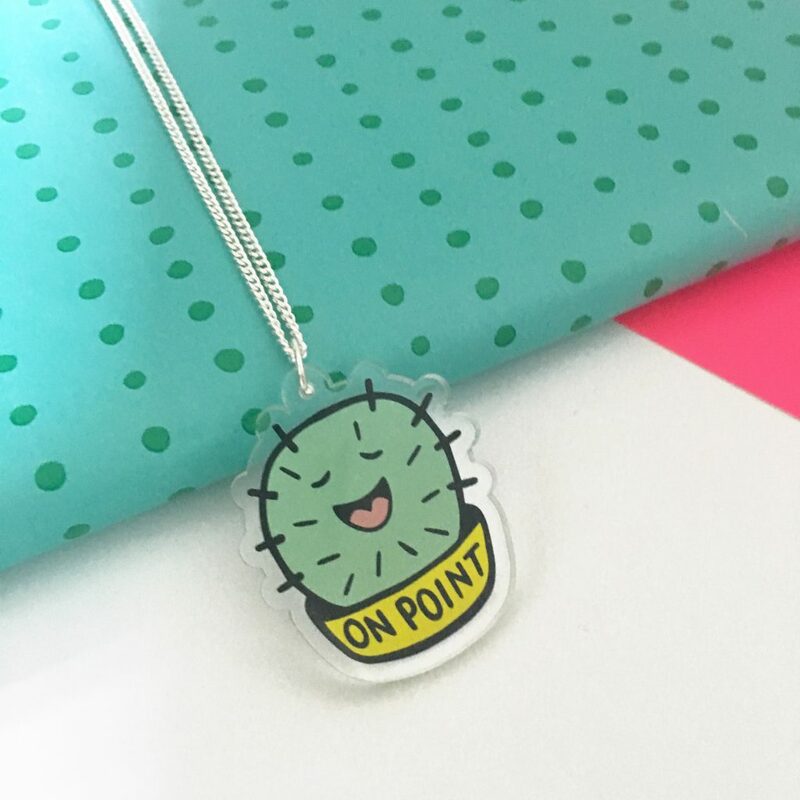 As a result of the demand, the adorable cactus is available as an enamel pin badge, a birthday card, a bottle opener and a giclee print. Oh, and of course, it’s now available as a super cool necklace! I’ve been wearing mine over the past week and have got heaps of compliments. Both the necklace charm designs measure approx 1.5″ – so they make fun statement necklaces! The designs were printed onto clear acrylic and then laser cut to bespoke shapes. I’ve got two different chain lengths to choose in my Etsy store as well – 18″ or 24″. These fun necklaces really do make the perfect gift for her or a quirky birthday gift. Or, if you’re feeling SUPER ORGANISED, why not a Christmas gift? (Fact – I bought my first Christmas gift two weeks ago!). You can buy both of these cool necklaces here. Once you buy, make sure you share a photo on social media for me! I love seeing your Ladykerry photos!